Prominent & Leading Manufacturer from Chennai, we offer galvalume roofing sheets and galvanised corrugated roofing sheets. We are one of the leading names in offering wide range of coated and non-coated Galvalume Roofing Sheets/cladding sheets and accessories precisely designed as per the latest technology and highly graded materials procured from reliable manufacturers. 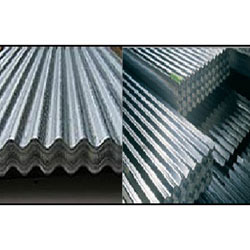 Understanding the needs and exact requirement of the construction industry we ably bring down a huge range of user friendly Galvanized Corrugated Roofing Sheets that comes in option of coated and non-coated. Designed and manufactured with the use of high grade material these sheets assure durability and strength at the user end.